Béchamel is a rich and creamy Mother Sauce made out of milk. It’s one of the five main source sauces from which other saucy recipes spring. The smooth white sauce is begun by making a light or white roux – briefly cooking the flour and butter until the flour begins to cook. Warm or hot milk is carefully stirred into the roux (or vice versa in the traditional manner) to create the sauce. Béchamel is then modified with seasonings or other elements such as cheese, onions, or shallots. Once you know how to make a Basic Béchamel, you will recognize it in many dishes from au gratin potatoes to Alfredo. Add a little of this and a little of that to make the sauce sing. Well, you get the picture. All of these dishes are made with a Béchamel. If the plan is to add a great lot of cheese (can one add too much cheese? ), make a thinner Béchamel by decreasing the flour. You are in complete control when you are the cook. Did you doctor say you need to eat salt free? Then skip the salt and add a bit of crushed red pepper flakes or any one of the seasonings in the cabinet. Use a mixture of cream and milk, whole milk, 2%, or even 1%. The flavors will change as you would expect. More fat makes a richer the Béchamel. Less fat means that your calorie log will be pleased, but you will need to add a few more herbs and seasonings. Please stir with wooden spoons, ok? When you do the coat the spoon test, it works better that way. Yes, you can substitute unsweetened soy or almond milk for cow’s milk. Experiment with both to find out which you like best! Vegan butter also works well instead of butter. Warm the milk in a separate sauce pan. It can be hot, but do not let it boil. If it gets hot before the rest of the roux is ready, just set it aside a few minutes. If you are adding small bits of onions or shallots, melt the butter in a heavy bottomed sauce pan set over medium-low heat and saute for a couple minutes. Then reduce the heat to low and proceed with adding the flour. If you are not adding extra ingredients now, melt the butter over low heat. When the butter is melted it is time to add the flour. Using a wooden spoon, quickly stir the flour mixture to the melted butter. Stir or whisk continuously until the mixture bubbles and the flour incorporates well. Stir continuously for about two more minutes. You should notice that the raw flour aroma changes as you cook. The roux may begin to change color, but for this sauce we do not want it to change beyond the original pale yellow. If it browns or burns because you just could not ignore the doorbell, clean the pan, and start over. Quickly stir in about 1 cup of the warm milk to the floury butter, stirring and adding more milk, until the sauce is well blended after each addition and make sure there are no lumps of floury roux. Then add the rest of the milk and stir. You may reduce any lumps either by smashing them on the side of the pot or using a whisk. Both ways are fine. Raise the temperature to medium-low and cook, stirring constantly for about 10 minutes or until the sauce thickens. It will not be stand the spoon in the pan thick. It will be generously coat the spoon with sauce thick. Stir slowly and constantly, scraping the bottom and sides of the pan as you go to makes sure the flour does not attach to the pot. If you forgot to warm the milk, the process will still work, it just takes longer, and there are more lumps to squash. Once thickened, reduce the heat to very low and simmer gently for about 2 minutes, continuing to stir constantly, then remove from heat and continue with your recipe. From here you may add whatever you need to finish your recipe. If you were over-generous with the flour and the mixture is too thick (can you stand a spoon in it? 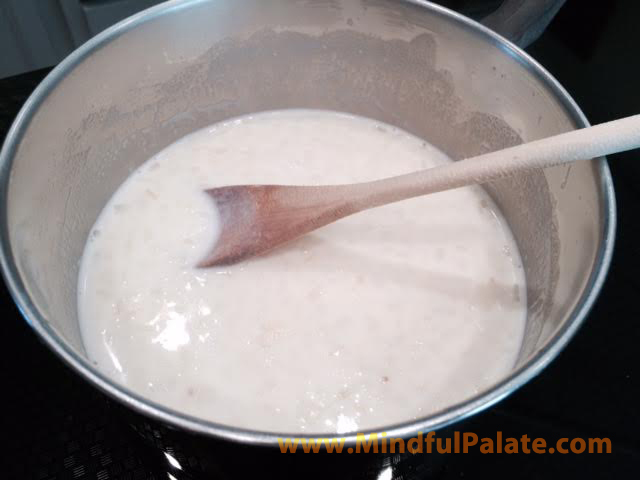 ), add a teaspoon or so of milk to thin the sauce until it is thick yet creamy. What shall we make with a Béchamel today? How about a fragrant casserole of Cauliflower and Cheese or my favorite Almost Swedish Meatballs? This entry was posted in Sauces, The Spoon Mage Explains and tagged bechamel, how to, milk, mother sauce, roux. Bookmark the permalink.